Visit to Lund – What About the Pottery? When the Alvastra project visited Lund in order to present our work with other Stone Age archaeologists we also got the opportunity to visit the collections at Lund University Historical Museum (LuHM). Greg was interested in the flint from Jonstorp and Stävie and I was of course interested in pottery! The sites that were of specific interest to me were Karlsfält and Stävie. The main reason as to why I am interested in the materials is that the pile dwelling pottery from Alvastra (PBK) has been compared to both Karlsfält and Stävie in the literature. 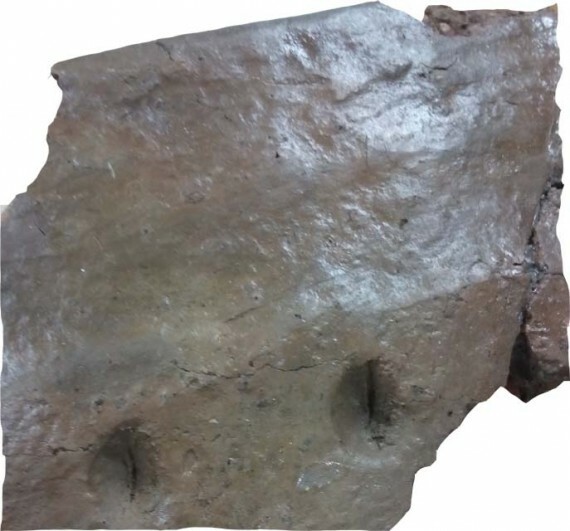 The described similarities are that both u- and n-technique were used as manufacturing techniques and, that the pottery is perceived as being particularly coarse when compared to other Neolithic pottery assemblages (see Browall 2011:286-291 and referred literature therein). The early-middle Neolithic settlement Karlsfält is situated in Southern Scania, Sweden. A few hundred metres from Fårarps mosse. A large quantity of flint artefacts and pottery have been found at the site (see Larsson 1985 for more details). The ceramic material from Karlsfält differs from that of the pile dwelling. The Karlsfält material is determined as Funnel Beaker pottery and it has also been worked more thoroughly and it is more intricately decorated than the pottery from Alvastra. 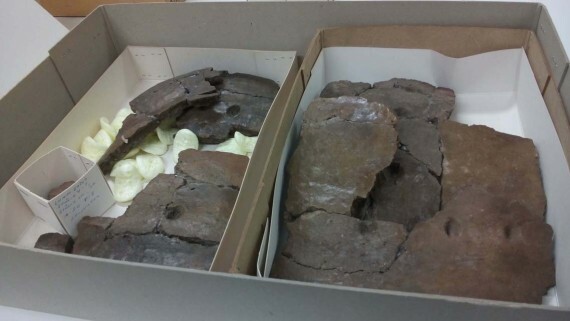 So called clay discs, both decorated and undecorated, are present in the material. A few sherds from Karlsfält (approximately 5-7 sherds) stood out from the rest of the material. Grey in color and tempered with the occasional rounded grain of gravel, the sherds bear the biggest resemblance to the pile dwelling pottery within the material. Stävie is located in the western parts of Scania, Sweden, and it is interpreted as a so called Sarup-enclosure (see Larsson, L. 1982 for more detail). Both Funnel Beaker pottery and a second type of pottery which is very similar to the PBK are present in the material. Both ceramic styles observed at Stävie are coarse and tempered with large grains of crushed red feldspar. A piece of the recontructed vessel found at Stävie which is very similar to the Alvastra vessel. 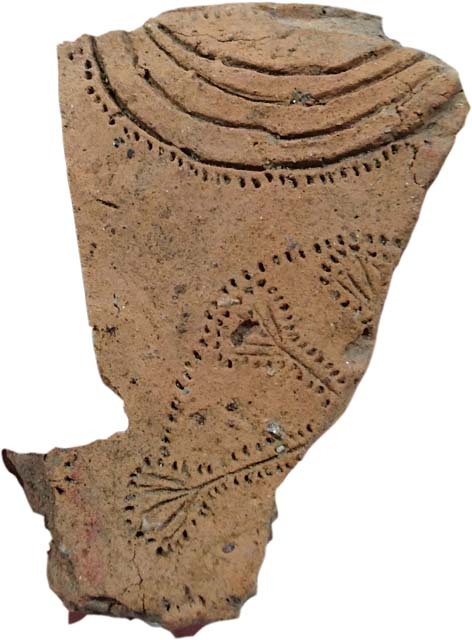 The sherd is decorated with finger imprints with the finger nail visible. The second type of pottery at Stävie was poorly homogenized, foremost formed in u-technique and decorated with large imprints – i.e. very similar to the PBK! The most common imprint on the Stävie-pottery seems to have been made by fingers. That fingers have been used is obvious since the imprint of the fingernail is visible! A large vessel has been reconstructed, and the vessel shape clearly corresponds to that of the reconstructed vessel from the pile dwelling. All in all, the second type of pottery at Stävie is clearly something different than the Funnel beaker pottery at the site, and it has clear connotations with the PBK-craft at Alvastra. It is worth mentioning that I did not have the time to go through the entire ceramic material from Stävie so it is possible that I missed something relevant for this text. Several pieces of the reconstructed vessel from Stävie. Three different styles of the same phenomenon? In conclusion I must say that I was surprised and extremely excited to see other materials that closely resemble the PBK, however, they are not entirely the same. Based on my swift review of the material from Karlsfält and Stävie I dare say that there is something different going on in the ceramic craft within these three sites. Whatever it is, and whatever it displays, I am glad to see that there are parallels to the PBK outside Alvastra! Larsson, L. 1982. A Causewayed Enclosure and a Site With Valby Pottery at Stävie, Western Scania. Meddelanden från Lunds Historiska museum 1981-1982. Lund. Larsson, L. 1985. Karlsfält. A settlement from the early and late funnelbeaker culture in southern scania, Sweden. Acta archaeologica vol. 54. 1983. Copenhagen. Hulthén, B. 1985. The pottery from Karlsfält. Appendix II in: Larsson, L. 1985. Karlsfält. A Settlement from the Early and Late Funnel Beaker Culture in Southern Scania, Sweden. Acta Archaeologica. Vol. 54. 1983. Copenhagen. Stilborg, O. 2003. Keramikhantverk i Välabäcksdalen. In: Svensson, M. (ed.) 2003. I det Neolitiska rummet. Lund. UV Syd. Avd. för arkeologiska undersökningar, Riksantikvarieämbetet. ss. 216-241.